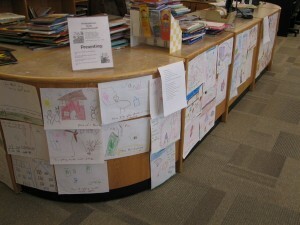 Waaay back in January (I told you I was behind) I did a Laura Numeroff author study with all the kindergarten classes. We read If You Give a Mouse a Cookie, If You Give a Moose a Muffin, If You Give a Pig a Pancake, If You Give a Pig a Party, and If You Take a Mouse to School. My copy of If You Give a Cat a Cupcake hadn’t arrived yet, I’ll have to save that for next year. We talked about circular stories; it was great fun. After we’d read all the stories we wrote our own If You Give… stories. 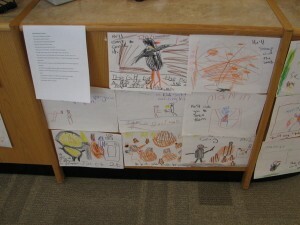 That was my favorite part because 5-year-olds have fantastic imaginations. 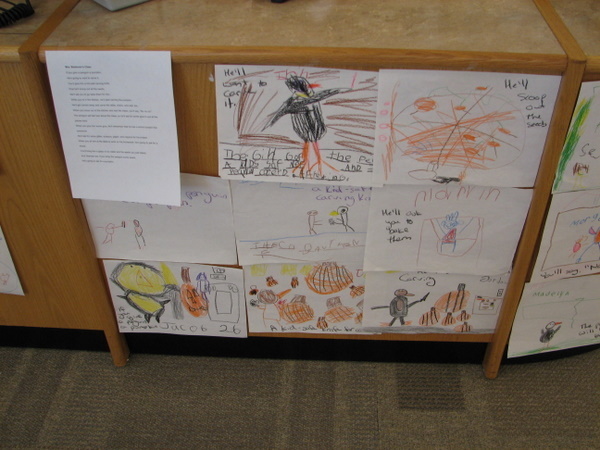 Each class came up with a story of their own (with a little librarian guidance to move things along), and then the kids drew a picture of a scene from the story. It worked out well that we ended up with pictures to represent every part of the story. So our stories were “If You Give a Horse Some Cake,” “If You Give a Penguin a Pumpkin,” “If You Give a Hedgehog a Race Car” (I had to show them pictures of hedgehogs, I don’t know which little clever person came up with that one), and “If You Give a Pig a Bird.” I can’t wait to do this next year. And then I’ll be better about hanging upthe display on time.